Apartment ŽIDIĆ - A2 / for 4+2 persons / 57 m² / 4. floor / Newly built luxurious and modern apartments for rent is located in the central part of Makarska next to the famous hotel "Meteor", close to the sea, beaches, restaurants, shops, cafe bars and entertainment facilities make it ideal for guests who arrive by plane in Makarska as well as for families with small children or the elderly. Apartment A2 consists of 2 double bedrooms + living room + kitchen and dining room in the living room, bathroom and balcony. Guests can use a garage for one car in the garage. Apartment Židić is only 30 meters from the sea and beautiful sandy beach, which is due to the fine sand and the natural shade of pine trees ideal for small children and the elderly, and 50 m from the city center. - LIVING ROOM : Satellite TV + WiFi - Internet + air conditioning + table + chairs and a sofa bed 200 x 160 cm + exit to the balcony from the living room, partial sea view. - KITCHEN:Open kitchen to the living room, stove with oven (4 glass ceramic hotplates), refrigerator with freezer, kettle, Cleaning products, cooking utensils, cutlery and drinks. - BEDROOM 1: Double bedroom + double bed 200 x 160 cm + wardrobe + air conditioning. - BEDROOM 2: Double bedroom + double bed 200 x 160 cm + wardrobe + air conditioning. - BATHROOM: Shower, toilet, hair dryer, washing machine, toiletries. 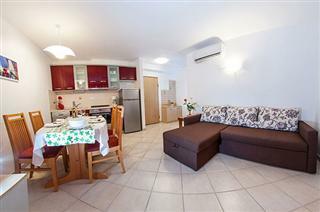 - BALCONY: Area 3.6 m2, table and chairs + view of the mountain and the sea. - GARAGE: Free garage for one car. Guest reviews are written by our customers after their stay at Apartment Zidic A2.